Should I meet up with the host before leaving my dog? SHOULD I MEET UP WITH THE HOST FAMILY THAT ARE GOING TO LOOK AFTER MY DOG ? If you opt for the family day care, it is crucial to meet up with the host family that are going to look after your dog before the stay. This way, during the first visit, you’ll be able to see how your pet react the environment your pet will be in. The first meeting should be as soon as possible. If the dog sitter doesn’t mention it , please don’t hesitate to ask first. If the stay is at the dog sitter’s home, to prepare your pet, please make sure that this first meeting is held at the host’s home. The fact that you will actually be there, with your dog, at the first appointment, will reassure your pet on the new temporary home. Some owners prefer to choose a family care in the holiday area, in which case the first meeting is awkward. But please feel free to set up a virtual webcam meeting with the dog sitter in order to put a face to a name and virtually visit the house. This meeting lasts roughly ½ hour. The purpose being to meet up with the host, to see in what environment the sitter lives in and to see if your pet with feel comfortable there. If your dog sitter has his or her own dog, it is very important that they meet before hand too. If your pet doesn’t seem to get on with the host’s own animal, we advise you to find another pet sitter care during your holidays. Please also make sure, the host isn’t caring for another dog during the lapse of time your pet will be there, or if so, it’s important for them to meet too. By opting for a neutral meeting point (public gardens, park …), there shouldn’t be a territorial dominating problem; the last thing you want is a dog protecting his home. When two dogs meet up it is essential not to be too pushy with them. The best way is by walking them both on separate leads and to meet up in a neutral area, like a public park for instance. To make sure that this meeting goes as smooth as possible, it is important to not organize a face to face meeting between the two dogs in a confined area. Please note that if your pet is a small dog, you mustn’t keep him or her in your arms. During this encounter, to keep control at all moments, it is essential to make sure both dogs are on leash. If for any reason, they start barking at each other and don’t get along, you need to be able to separate them as soon as possible. What subjects to discuss with the dog sitter ? This first encounter is a great opportunity to see where your pet is going to be looked after during your stay away. Don’t hesitate to ask all the relevant questions you may have, this is a great time to discuss any issue concerning your dog’s well being. How high is the fence? How big is the garden? Are there any other outside that my pet will in contact with? Does the dog-sitter have children? In which room is my dog going to sleep? Where can my pet roam in the house? How many walks a day? How long will the walks last? Has the family cared for similar dogs in the past (same size, breed…)? How long has he been dog sitter ? Does the dog sitter have any pets of his own? How often will the dog sitter be at home during the day time? 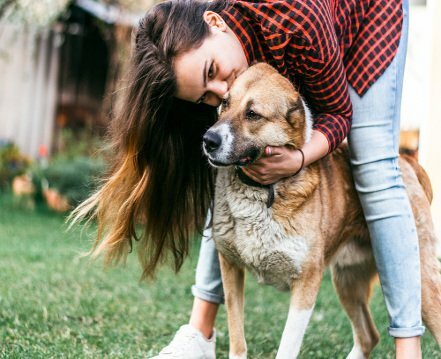 When your four legged friend is going to stay in a host family, it is essential you realize that your dog will be affected by your absence and the home changing.